A new day and another early start. One of upsides of US road side motels, is that apart from being cheap, they all serve a basic breakfast usually consisting of juice, muffins and an ingenious waffle making machine – something of an irony that the luxury hotels we’d booked all charged a rip off $15-25 for breakfast. After finishing up and loading the bags into the car we attempted the automatic car wash at the garage next door. Whilst not quite as high tech as ones in the UK it managed to remove most of the dust, mud and bug splatters that had baked on the car. Once on the road we headed south, out of South Dakota crossing over briefly into Iowa and then into Nebraska. For the most part, the drive was along dead straight roads flanked with corn fields and other crops. 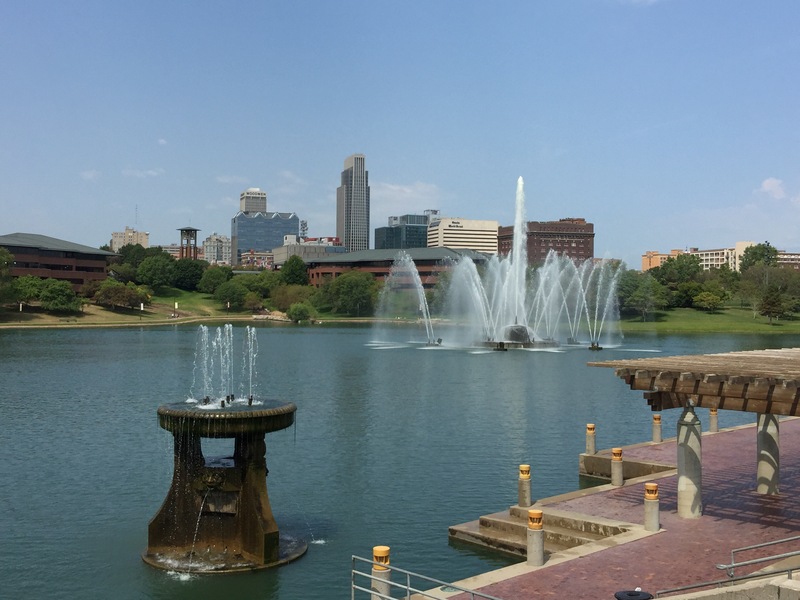 Our first stop of the day was in historic Omaha, the largest city in Nebraska. We parked up in the Old Market area of town and despite the overcast weather were pleasantly surprised just how pretty the city was – old warehouses and industrial buildings all beautifully converted into restaurants, coffee shops, boutiques and apartments. We decided to stretch our legs before lunch so took a wander down to the Heart of Americas Park. 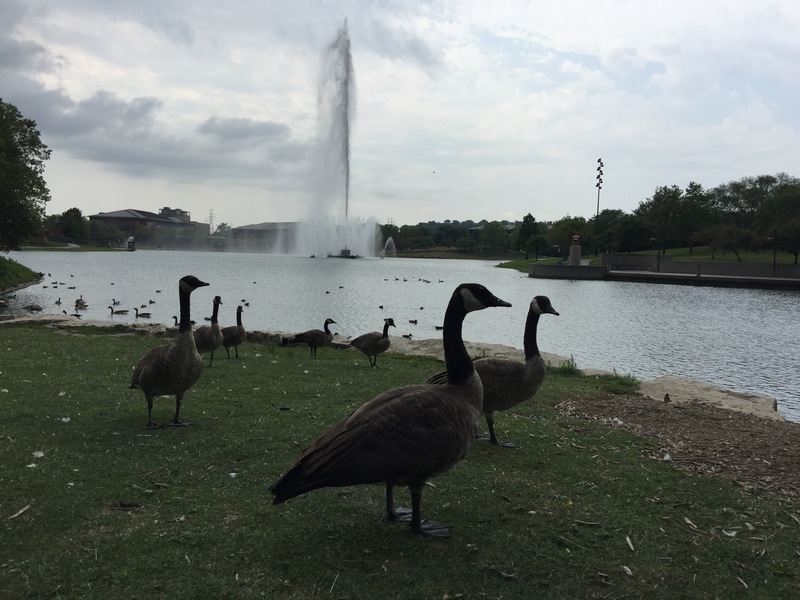 After initially getting lost and walking into a corporate office park, we made it down to the lakeside where we were greeted by dozens of geese. In the few minutes we paused to take photos the heavens began to dark and we (and the geese) were forced to run for cover as a torrential storm passed over. As quickly as it arrived, the storm was gone and with the clouds parting the sun baked down and the temperature soared. 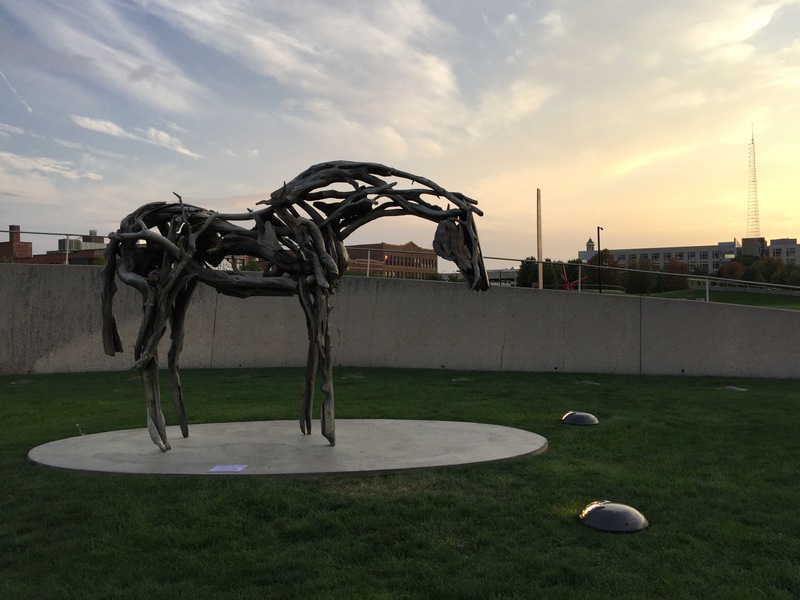 We walked the lakes edge, visited a number of statues and memorials surrounding it and climbed a viewing point which overlooked the mighty Missouri River which flows through the city. In the middle of the lake is a giant fountain which can be seen from across town – as we walked the full path around the lake we watched it shoot jets of water a hundred or so feet in the air. With the midday sun now upon us we headed for lunch at Spaghetti Works – an Italian restaurant in one of the converted warehouses in the Old Market. The Art Deco interior decor and good food made it a memorable stop. 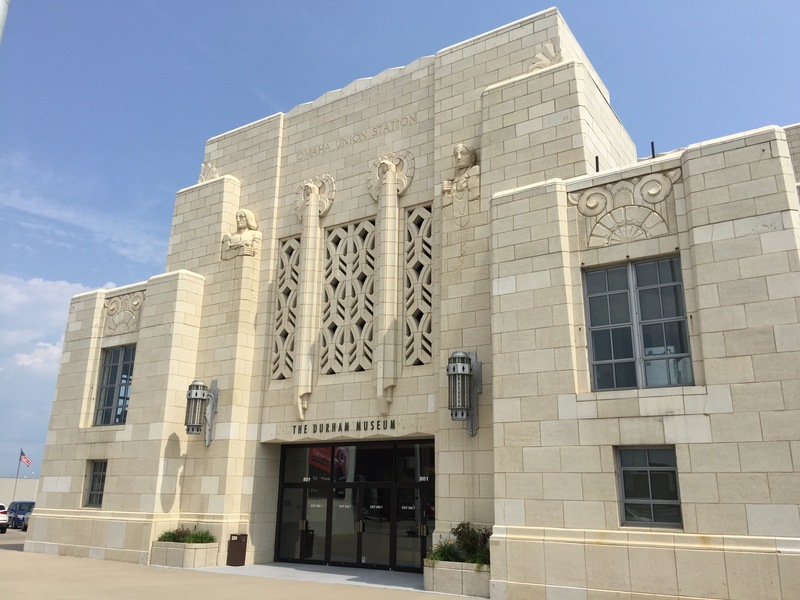 After lunch we took a short wander around the surrounding neighbourhoods, stopping at the Durham Museum to admire the striking Art Deco building. Short on time and with a long drive ahead we got back on the Interstate highway and headed east. With the exception of regular road works, the drive through Iowa was uneventful – mile after mile of corn fields and wind turbines. The road side rest stops giving me a chance to send LARS up for a look – only to confirm it was more of the same as far as the eye could see. We arrived in Des Moines in the late afternoon and after checking in to our motel we decided to head out and see some of the city. We’d read about a ‘sky walkway’ that connected most of the downtown buildings which sounded like a good way to see the city. We were somewhat disappointed to discover it was more like an airport skybridge system that connected office and government administrative buildings throughout the city. 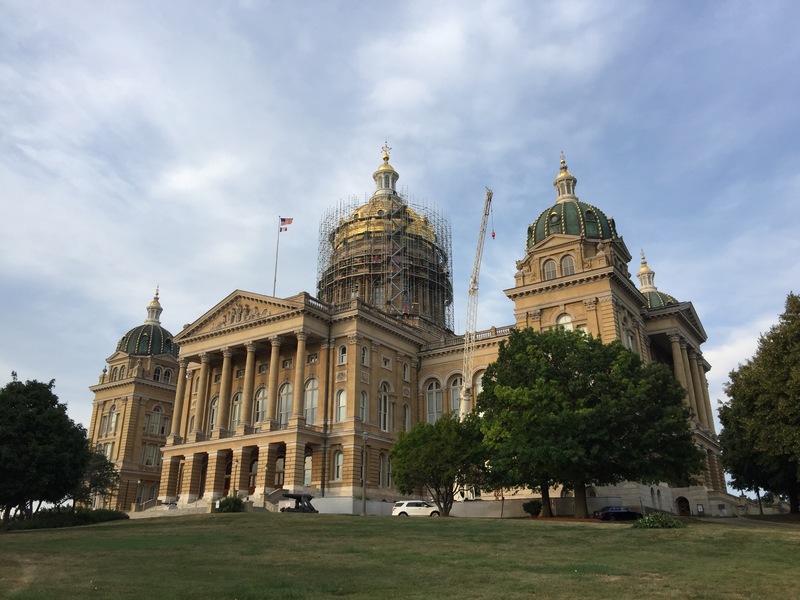 If you’re the type that likes airconditioning and not having to set foot outside this maze of walkways is for you – it just made me feel claustrophobic so we headed outside and took a walk to the State Capitol building. It’s certainly a theme of all the great American cities – spectacular grand government buildings and statues. The Des Moines Capitol Building was among the finest we’d seen – perched on a hill looking straight down through the city centre. Surrounding the building are several impressive monuments, commemorating major events and Iowas role in the Union. 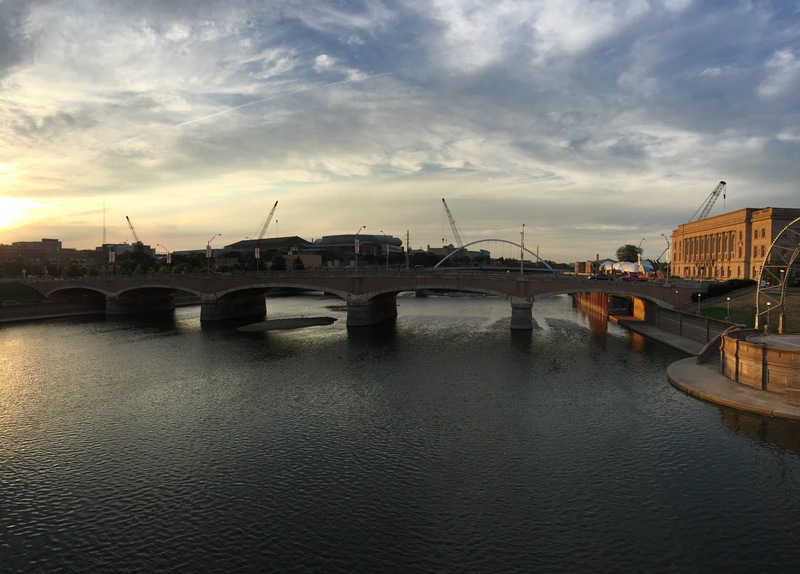 From the Capitol Building we ventured down to one of the many bridges crossing over the Des Moines river. With the sun starting to set we enjoyed the fantastic colours and shadows being cast over the river. From the bridges we decided on one final stop at a local park which had become a garden for modern art. Whilst not all the pieces were to our taste, nor could we work out what they all were, several striking sculptures looked imperious with the sun setting in the background. As night fell, we headed back to the motel, for Vanessa and Andy the next morning would be their last leg of the road trip.